Therapy Chicago: Is Your Partner an Introvert or Extrovert? 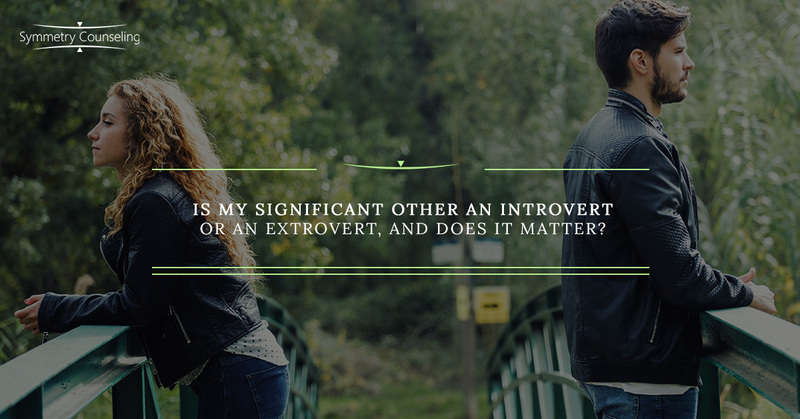 Is My Significant Other an Introvert or an Extrovert, and Does It Matter? Have you ever wondered if you are an introvert or an extrovert? If your significant other is an introvert or an extrovert? The extrovert/introvert scale is actually a spectrum as some people are a blend of both. One way to find out where you might fall on the spectrum is by taking the Myers Briggs Personality Test. So, you take the test and realize that you and your partner are not the same type. Does it matter if one of you is an extreme introvert and the other is an extreme extrovert? The short answer is… kind of. It can be challenging to understand why you respond differently to circumstances than your significant other. You likely will have different reactions, interests and motivations if one of you is an introvert and the other is an extrovert. Going In Versus Staying Out: Introverts tend to be more comfortable and energized in the comfort of their own home, while extroverts tend to be energized by being surrounded by many people. • Compromise: If one of you is an introvert and prefers staying in all night, but your significant other wants to go out with their friends for most of the night, attempt to create a compromise. Make arrangements to stay out until 11 or whatever time is comfortable for each of you. • Find Mutual Hobbies/Interests: If one of you enjoys going out and being surrounded by a ton of people at a concert, and the other one enjoys spending time in listening to music and reading, you might find you are often doing things apart. It is important to find a mutual hobby. Something such as going out to a trendy new coffee shop could be a mix of both interests. Handling Disagreements: Introverts tend to need to reflect for a longer period of time before discussing what it was that triggered the disagreement, while most extroverts want to handle the disagreement immediately. Keep in mind neither one is right or wrong, these are just two different personality types. • Be Proactive for Disagreements: If the introvert wants space to cool down from a disagreement, it is recommended that they (the introvert) then initiate the conversation with their significant other. Otherwise the extrovert is left wondering when their significant other is ready to discuss the disagreement. Knowing this as the resolution plan ahead of time will create a more proactive way to handle conflicts. Alone Time Importance: Introverts tend to need more alone time. If you identify as being an extrovert and your significant other is an introvert, try to remind yourself that alone time does not mean they do not care about you. Attempt to not personalize their alone time as not wanting to spend time with you, but that it is just their time to reenergize themselves to be their best possible self. Reminding yourself that it will likely be more enjoyable once they are fully energized can be helpful as well. Embracing and Accepting the Differences: Remind yourself that your significant other is with you for many different reasons, and as long as you find it to be a healthy relationship, embrace that you two likely are balancing each other out. Acceptance of your differences can create a more creative, exciting, and healthy relationship! Opening a discussion with your significant other about the differences can create an interesting way to help you each better understand one another. Dating someone who has different personality traits than you can be challenging. While this list provided a variety of ways introverts and extroverts interact and react with one another and ways in which to cope, only you will truly know what works best for you and your significant other. If you are currently struggling with accepting the differences with your significant other, it may be a good idea to connect with one of our skilled counselors at Symmetry Counseling today. You can contact them at 312-578-9990 to set up an appointment.